For the 2 million monthly followers of powerhouse wedding blog StyleMePretty.com, the major mainstream hit with serious indie cred (think Domino meets Etsy meets Martha Stewart Weddings), and for all brides looking for fresh new inspiration, editor in chief Abby Larson offers an eagerly awaited, entirely unique, and gorgeously photo-rich wedding resource. Joyful, love-filled weddings are created with the details that make the couple unique. These touches--letter-pressed table cards with a pet bulldog cameo; a chandelier to which the bride and groom tied hundreds of colorful ribbons; a photograph of the bride's grandparents fastened around her bouquet--elevate a beautiful day into a deeply personal, unforgettable celebration. 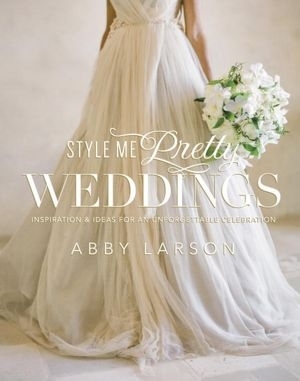 Full of lively and oh-so-lovely ideas, and more than 250 photographs, this swoonworthy volume will help you distill the wide world of wedding inspiration. Love Style Me Pretty Weddings? Subscribe to Read More to find out about similar books.